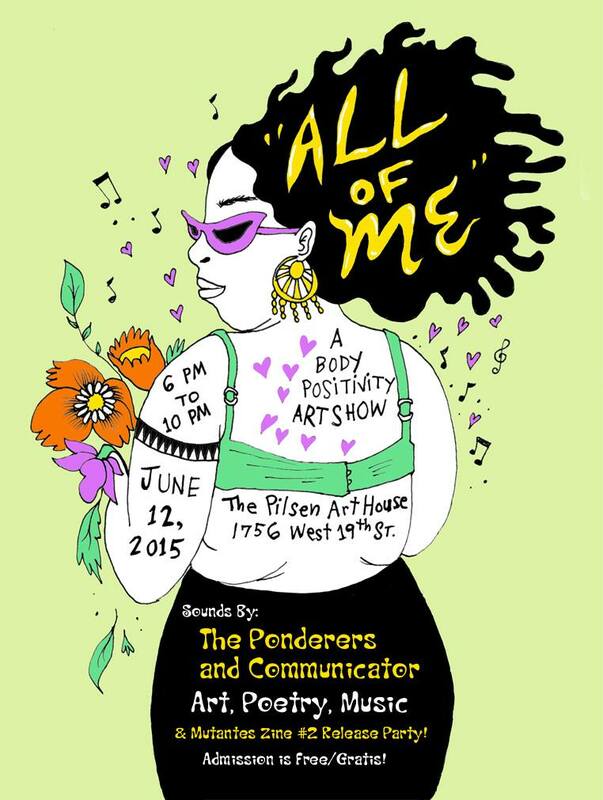 Naomi Martinez, the wildly imaginative artist creating art as Monstrochika, has put together a one of a kind body positivity themed art showcase taking place tonight at The Pilsen Art House. “All Of Me” will feature work by Chicago artists that contributed to the second issue of the Mutantes! Art Zine which will be released and available tonight. The event takes place from 6-10PM with music by The Ponderers and Communicator. Naomi Martinez, who grew up in Logan Square, was first exposed to painting and hand-crafting as a teenager through artist programs at Marwen Foundation and Gallery 37, which eventually led her to study Advertising, Art & Design at Columbia College. Martinez has exhibited her work throughout the city. Nationally her work has been displayed in Minneapolis and NYC thanks to Intermedia Arts’ B-Girl Be Summit and Younity Arts Collective. 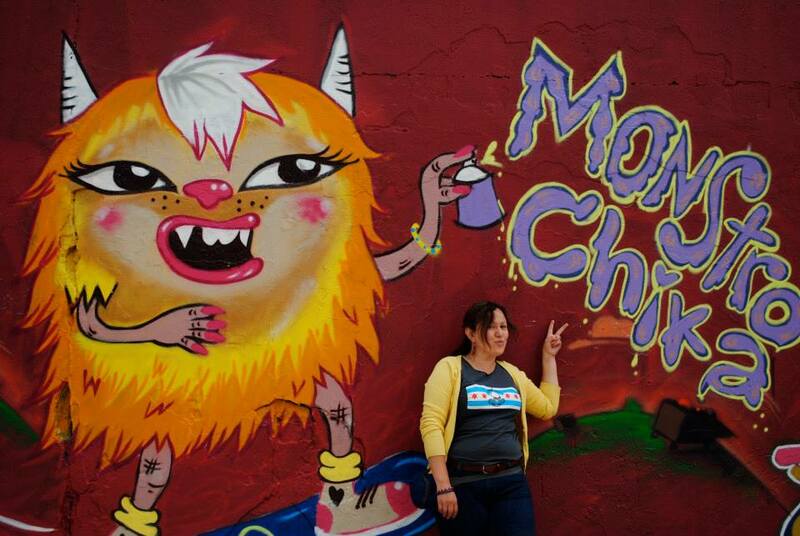 She is currently co-founder of the all-female artist collective, Mujeres Mutantes. Gozamos spoke with Martinez about the significance of tonight’s event. What can people expect at tonight’s show and where did the concept come from? 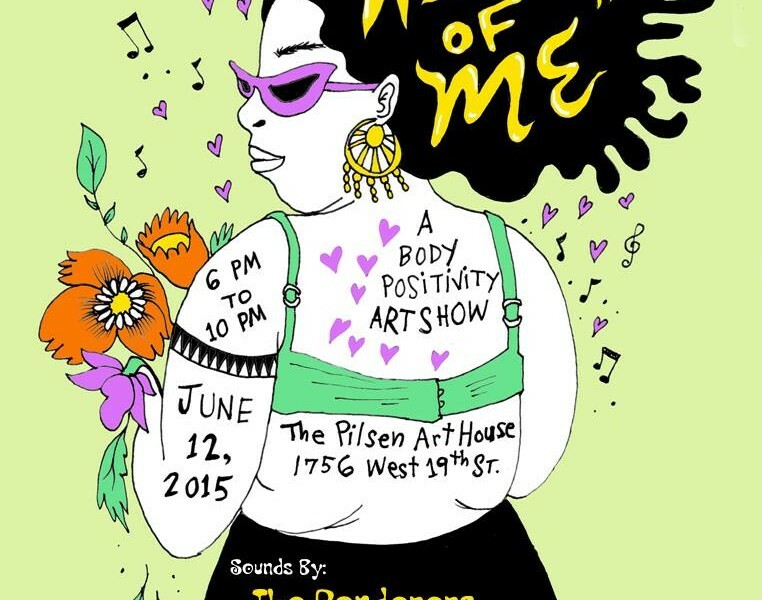 There will be artwork, poetry readings and music to groove to with good people. The concept came from conversations I have all the time with friends about what we see in the media and the serious lack of REAL women of all shapes and sizes! It’s about celebrating your originality, your mind, spirit, attitude… the list goes on. These are the things we need to be nurturing since very early on: to be strong enough to not be so affected by all that bad stuff we get bombarded with. Is this the first show that you’ve been involved in that revolves around this topic? Yes. It is actually the first show I’ve been in with this topic. As my art has evolved I’ve really gotten into women’s issues. Its something I care about and follow not just what’s affecting us here but the world. I also really threw myself into zine making this past year. I attended Chicago Zine Fest in May and attended a P.O.C. zinesters panel that really helped me get hyped about this event and getting dialogue going about stuff I care about. My community of artist friends are also so amazing and supportive and that was the final ingredient. Who or what is Monstrochika? Monstrochika sprouted from my imagination sometime in the year 2000. She came to life inside a swirl of vibrant colors surrounded by magical creatures. I had been drawing cartoonish girls since my high school days but this one stood out instantly. She had a unique expression and stance that I loved. I kept working on her and all the sidekicks that started accompanying her. Pretty soon a whole monstroworld came spilling out complete with hungry flytraps and strange shaped flora. Monster in Spanish is “monstruo” and “chica” means girl. I came up with my own fun spelling of monster girl. Monstrochika! My girls do not have names. They are all Monstrochika. I set my mind and pencil free to create all my characters. No two chikas or sidekicks are ever alike but they all carry my signature style. Monstrochika does not come from a happy home and chooses to roam the streets. She moves between city and the patches of nature that remain. Alley cats follow her because they sense her loneliness. The monsters remain visible only to her because they sense her kind heart. 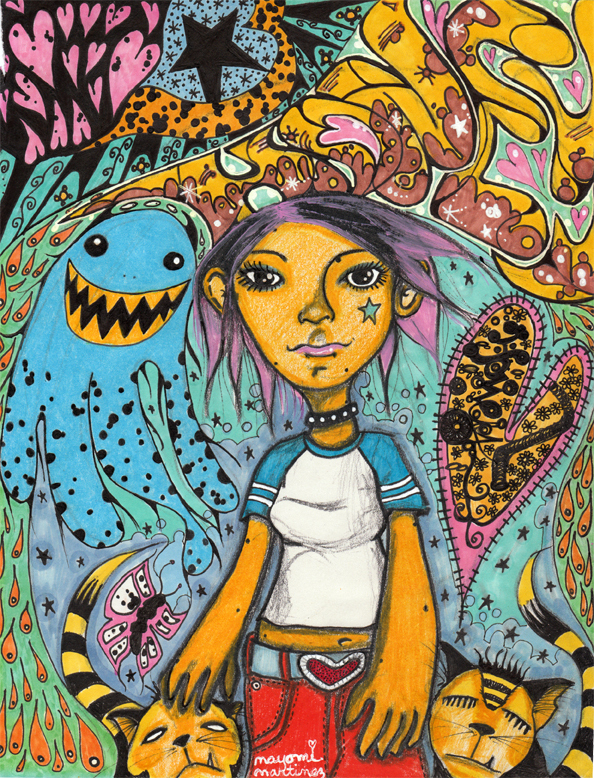 Martinez is inspired by indie comics, nature, her upbringing in Chicago, Japanese animation and the Superflat movement. Her work is portrayed in all sorts of mediums including traditional illustration, painting, DIY comics/zines, doll making and spray-painted murals. If you follow her online, you’ll also notice her hashtag #oldchicagolady. Are there thoughts of creating work related to #oldchicagolady? #oldchicagolady is something that I came up with for those moments of sheer crabbiness that make me sound like an old person. That is actually not a bad idea! The collective sayings of #oldchicagolady. Ha! Is there a particular spot in Chicago you go to for inspiration? Just walking around and feeling the vibrancy anywhere in my city is electric. I enjoy watching kids interacting with the world around them, women in all their many styles of dress, pets, squirrels, pigeons, the trees. It sets off memories of growing up here and what is truly important in life to me. MUTANTES! art zine is an ongoing project created and curated by Naomi Martinez, Chicago artist and co-founder of Mujeres Mutantes Art Collective. The project aims to showcase raw outsider art and writing by Chicago women artists in celebration of our complex identities and art influences. Please join us for an art exhibition and the release of our 2nd issue! Mutantes #2 is our first body positivity issue and will be available to purchase for $6.00 at the event. The zine is a D.I.Y. publication and your purchase goes towards future zine projects that create dialogue about women’s issues we care about in the arts, media, our communities, society, the world. Mujeres Mutantes is an all-woman LGBT friendly art collective hailing from Chicago with roots in the Pilsen neighborhood. We have united to empower and support one another and other local creative women. Through our collaborative efforts we strive to make art visible and accessible to all. Our community involvement includes all-women graffiti artist mural productions, affordable all ages workshops and art exhibitions with participatory art projects for the community.